Carina is twenty three and lives in Watford. She has acute disseminated encephalomyelitis, a neurological condition characterised by muscle weakness, which makes standing and walking difficult, so she needs to use a wheelchair. 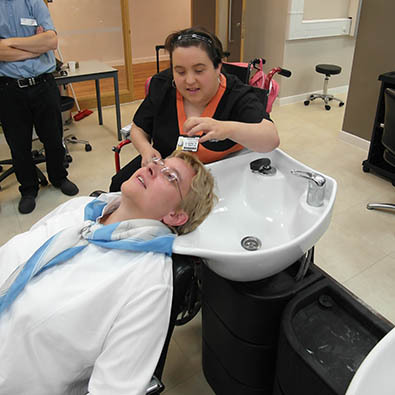 She wanted to start a Hair and Beauty course at the Technical College in Hemel Hempstead but her acceptance on the course was dependent on her being physically able to work on clients at a variety of heights. Our team made a battery powered mechanism that is attached to the underside of her wheelchair. Carina can position the wheelchair manually then raise herself to carry out her practical course work easily & comfortably.